1.Print the templates and cut out all details. Make the folds along the dotted lines. 2. Using sided tape or glue, fasten all tabs A on the left side of the case to the corresponding parts, then fasten all tabs B to the corresponding parts. 3. Fasten all C tabs on the right side of the body to the corresponding parts. 4. Fasten the two sides of the body of the fish together, starting with the tabs D (Eyes and mouth Nemo). Continue to pin both sides using the E, F, and G tabs. Glue the H tabs on the corresponding parts and close the body shape using the I-tabs at the back. 5. Fold the tail in half along the dotted line and turn the reeds outward. Fasten the two halves so that the design is double-sided, then use the tabs to attach the tail to the back of the body. 6. Bend the dorsal fin in half along the dotted line and fold the reeds outward. Fasten the two halves so that the design is two-sided, then use the reeds to attach the dorsal fin to the top of the body. The strip on the dorsal fin should coincide with the band in the center of the body. 7. Fold the rear fin in half along the dotted line and fold the reeds outward. Fasten the two halves so that the design is double-sided, then use the tabs to attach the rear fin to the bottom of fishes body, just below its tail. 8. 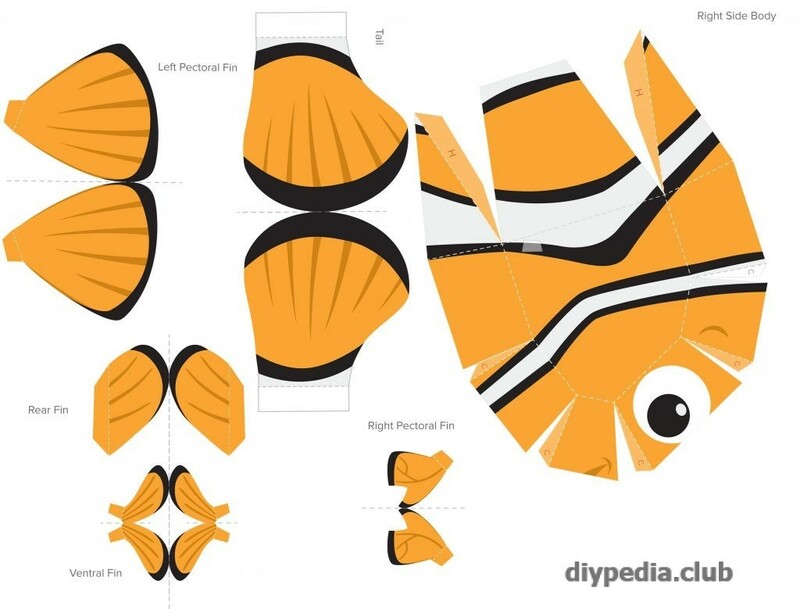 Fold the right and left pectoral fins in half and fasten so that the designs are two-sided (the tabs must also be glued together to form one tab on each fin). 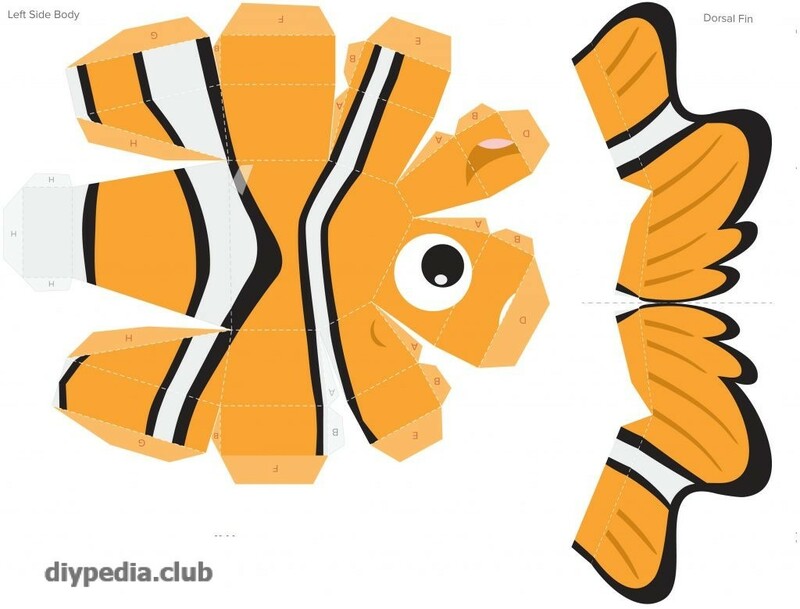 Fold the tab on each fin back and attach the left and right pectoral fins to the body where indicated. 9. Bend the abdominal fin in half and fasten so that the design is two-sided (the corresponding tabs must also be glued together to form two separate tabs). Fold the part in half along the dotted line, then bend the two tabs and use them to attach the abdominal fin to the bottom of the body fish just behind its first lane. 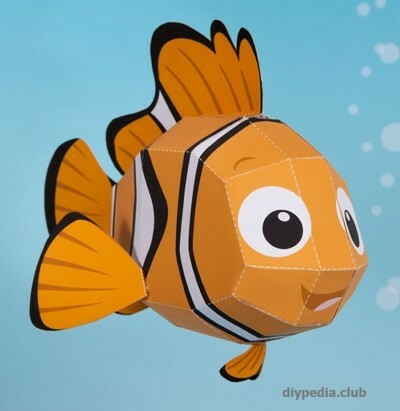 The paper fish is ready! In this way you can make different animals, for example, a mouse. The template of a mouse from a paper look here.